Summary: Maggie is a kind-hearted girl who lives in the Enchanted Forest with her father, stepmother, and many step-siblings. Her father has to be away a lot for his job as a woodcutter, leaving Maggie at the mercy of her wicked stepmother. Maggie’s greatest joy is finding magical animals in the forest. When she accidentally injures the wing of a tiny horse-fly, she decides to go in search of the legendary Bob the Stableman, whom her grandmother has told her lives outside the castle and cares for magical creatures. Defying her stepmother’s orders, she sets off to find Bob. Along the way, she encounters a griffin, some goblins, and a nasty troll. She makes it to Bob’s, though, and gets help for the horse as well as for herself. Stay tuned for more adventures in book #2, Maggie and the Wish Fish. 128 pages, grades 1-3. Pros: Don’t be fooled by the page count–the font is large and there are lots of pictures. 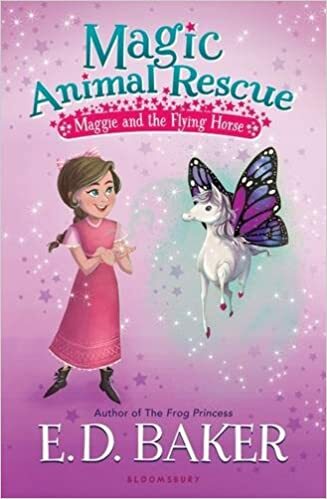 Fans of Rainbow Magic and other fairy tales will be eager to read about Maggie and her magical animal friends, and the reading level is manageable for those just moving into chapter books. Cons: Maggie occasionally comes across as a bit of a goody-two-shoes.